Hall of Fame slugger Harmon Killebrew, who died of esophageal cancer Tuesday in Arizona at age 74, was one of two great major league baseball players to come from Idaho. The other was Kansas-native Walter Johnson, a power pitcher and a member of the first Hall of Fame class in 1936. His legacy may be two things away from the diamond—the golf tournament Killebrew helped create and the dignified way he died. The golf tournament is the Danny Thompson Memorial, which started in Sun Valley in 1977 and in its 34 years has raised over $11 million for leukemia and cancer research. Infielder Thompson was a Twins teammate of Killebrew. When Thompson died of leukemia in 1976 at 29, Killebrew wrote a $6,000 check for leukemia research. But he wanted to do more to ensure Thompson’s name would endure. Killebrew, retiring from baseball in 1975, went into the estate planning and insurance business in Boise with former Idaho congressman Ralph Harding. The two men had little in common. But their partnership took off when Killebrew mentioned a desire to remember Thompson and Harding suggested a fund-raising golf tournament in his name. 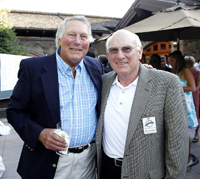 Reflecting the deep-rooted Idaho values of Killebrew and Harding, the Thompson tournament has methodically contributed money each year to the University of Minnesota Cancer Research Center and St. Luke’s Mountain States Tumor Institute. Last year’s contribution was $650,000 split between the two institutions. Having revealed his own battle with cancer last winter, Killebrew on Friday made a simple statement of farewell. He died four days later. Killebrew will be remembered today at a funeral service in Peoria, Az. The family will stage a private burial service Monday in Payette, the southwestern Idaho town where Harmon Killebrew Field is located at PayetteHigh School.